The Crimson Tide win their fourth straight league game and move into a tie for second place. Things are looking up for the Glencoe Crimson Tide girls' basketball team. With their 68-54 home win over Century Tuesday night, Feb. 5, the Tide won their fourth in a row and moved into a three-way tie for second in the Pacific Conference. 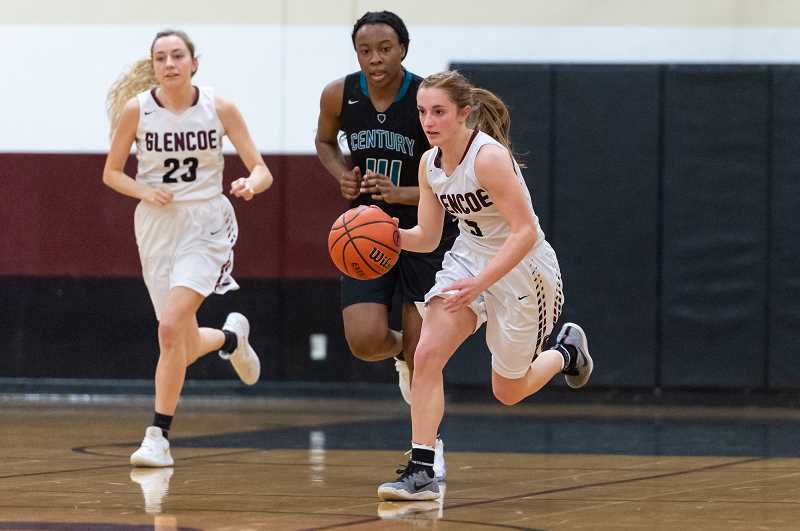 The winning streak comes on the heels of three straight losses to start the conference season, but with time, experience meshing their older and younger talent, along with health, Glencoe has righted the ship and now finds themselves in position to fight for the league title. "I thought we did really well," said Tide head coach Kassi Conditt. "We're finally healthy and I have all of my team back and that obviously helps. We're moving the ball well, playing defense well, and we've changed some things that have freed the right people up to make the right plays." One of those players is point guard Morgan DeBord who scored 26 points against the Jaguars and has tallied 51 combined points in her last two games. The senior scored in a variety of ways on this night, netting four 3-pointers, hitting a small handful of runners in the lane, and icing the game with five free throws in the final two minutes. "As a team we worked really well, and we really used our bench which is good because we didn't just rely on our starters," DeBord said. "We moved the ball well and played solid defense, which we didn't do last time we played them (Century)." DeBord, when asked the difference between the team during their earlier struggles and now, spoke to a couple technical things, but leaned primarily on an ever-growing mindset that is bringing the team closer together. "I think we're more relaxed at practice and I think when you're having fun in practice, you tend to enjoy games more," she said. "We're using more of a zone defense which has been working, but more than anything, we talk more, have done some team bonding stuff and we've grown more as a team." After trailing 6-2 early, Glencoe took a 16-9 first quarter lead thanks in part to a couple three's by DeBord and Breauna Van Dyke. The Tide expanded their lead to 10 thanks to eight straight points, including two more DeBord 3-pointers and a nifty runner by sophomore Bella Martinez. 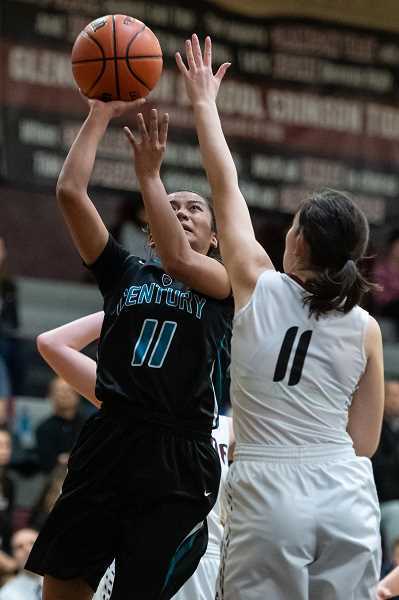 Century (4-4, 14-6) however answered with four consecutive Amy Walkenhorst points, then when senior guard Janelle Maligaya hit back-to-back three's it was 24-22 Tide, and we again had a game. Glencoe took a 31-27 lead to the half and quickly made it 40-29 to start the third, thanks predominantly to nine straight points from Van Dyke and teammate Sydney Larrison. Brianna Ball added four of her own, and when Martinez ended the quarter with a baseline 10-footer, the Tide led 48-39 headed to the game's final stanza. Martinez, who finished with eight points, was one of eight Glencoe players who scored in the game and one of five who scored five points or more. The widespread scoring has become a staple for the Tide since their resurgence, and Conditt believes it's an added awareness of who's doing what that's contributed to that. "We've talked about finding who's hot at the time," said the coach. "We've had some games where girls would get hot and score a fair amount of points, but I think we're doing a better job now of figuring out who that player is, and creating ways to get them the ball." In addition, the coach agreed that a more positive mindset has also played a vital role in the team's recent success. "My seniors are really supportive and uplifting, and I think they've started to find the joy in it all," Conditt said. "I think in the beginning when we were losing and the injuries were mounting up, I think it took it's toll. But lately they're having fun and having fun together, and I think that shows." Century never got closer than nine points in the fourth quarter and trailed by double digits for most of it. As a result of the win, DeBord was pleased with her team's effort and more so with their play over the last two weeks, citing a specific moment that may have created the necessary inspiration to take this now obvious step forward. "I think since the last time we played Century and only scored like six points in the first half, we realized we needed to work harder," said DeBord. "We have, and it's fun to see." In addition to DeBord, Glencoe was paced by Martinez who scored eight points, Ball who had seven, and Larrison who talled five points and nine rebounds. Century was led by Maligaya and Walkenhorst who scored 16 apiece, along with Gavyn Shafer and Olivia Boone who combined for 18 points and 14 rebounds. Glencoe is scheduled to play at first place Liberty this Friday, Feb. 8, at 5:45 p.m. The Jaguars will travel to McMinnville, Feb. 8, for a 5:45 p.m. game with the Grizzlies.